3. Log in the APP(AIBEILE),Register an account and enter your ID number which is on the packing box. 4.You can use it now, if you have any questions, please fell free to contact us. Note: Now in the market many 3G/4G sim cards are not compatible with 2G network(GSM 850,900,1800,1900MHZ),so if you buy the sim card,please ask for 2G or 3G/4G that can support 2G network. If your father is suffering from Alzheimer's, it's too far away from home and is in danger, you can track his position. Keep track of your kid and make sure he gets home safely after school. Follow up your spouse or partner and see their position when they are "late". 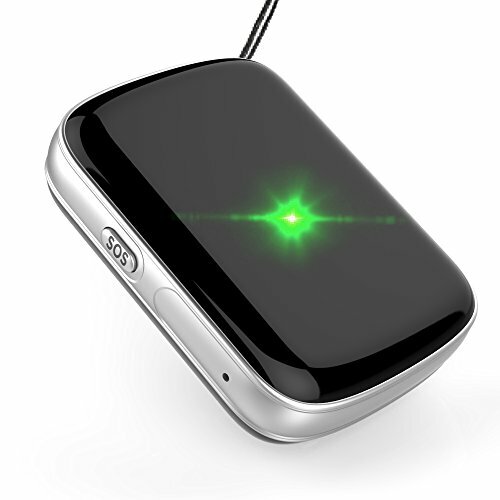 Real-time monitoring of your car and your valuables, even 10 meters of movement, will get feedback. As a maker, we believe in our products.That's why we back them all with an 18-month warranty and provide friendly, easy-to-reach support. Precise positioning-The tracker's default positioning mode and order is GPS: 5-15 meters (Outdoor), WI-FI: Within 10-50 meters (Indoor WIFI signal) and LBS Within 50-1000 meters.The Historical route query will keep 3 months. Call Function&Voice Monitoring-Dual-call function,SOS emergency call,Remote monitoring,voice monitoring and no disturb mode.Please insert GSM network Nano SIM card which can support one of the network modes: GSM 850,900,1800,1900MHZ. Waterproof & Longer Lifetime-IP67 waterproof, you can use it in wet conditions, rainy days and sweaty sports.1000mAh battery capacity.Long standby time can reach 15 days,working time can reach 2 days. Application scene-Anti-lost when children are playing in the park.Anti-lost when the elderly go out alone.Anti-lost when you take your dog out for a walk.Put it in your bag, when you can not find your bag, you can easily find it by the tracker. If you have any questions about this product by HiOrange, contact us by completing and submitting the form below. If you are looking for a specif part number, please include it with your message. AES RGT901 GPS Tracker GPRS Mini Portable Vehicle Motorcycle Locating Tracking Device. PRE-ACTIVATED SIM CARD WITH 3 MONTHS SERVICE INCLUDED!! !